Dr.Anthony Andre Kenneth Hodge Sr. ministerial journey began October 30, 1998, when he delivered his first sermon, “Take the Mask Off, the Masquerade is Over”. He while serving as a Deacon of Mt. Gillion Missionary Baptist Church in Cleveland accepted the call from God. He had the privilege to be nurtured in his early ministerial growth and development by Reverend Dr. Freddie L. Brown, Pastor, Mount Gillion Missionary Baptist of Cleveland, Ohio. Dr. Brown directed him to the Reverend Dr. F. O. Hockenhull, Pastor, First Trinity Missionary Baptist Church, Flint, Michigan, who is his father and meteor in this prestigious preaching and teaching responsibility with God’s people. He has been involved with every phase of his maturation as a man, a father, a preacher and now as a pastor. Dr. Hockenhull sent him to work with the Reverend Dr. Walter R. Brown; Pastor, Second New Hope Missionary Baptist Church, Evansville, Indiana. Upon leaving for a job reassignment he sent him to work with the Reverend Dr. T. Oscar Chappelle Jr., Pastor Morning Star Missionary Baptist Church, Tulsa, Oklahoma. After returning to Flint, Pastor Hockenhull welcomed him home with open arms and assisted him through some of the most difficult times of his life. Pastor Hockenhull directed him to the Reverend Dr. Alvin C. Bernstine, Pastor, Bethlehem Missionary Baptist Church, Richmond, California. These most prominent Men of God have all played a great role in his preparation, for this most daunting task of Rebuilding of God’s Temple in Rodeo, California. Pastor Hodge holds a Bachelor degree in Theology from Liberty Baptist University, Lynchburg, Virginia, a Master degree in Divinity from Liberty Baptist University and a Doctorate degree in Pastoral Services from Liberty Baptist University. Pastor Hodge also is a graduate of Bible Baptist Institute, seminary of Cleveland, Ohio. Pastor Hodge is an active member of the Progressive Baptist Missionary Education District Association. He is also actively involved in the California Baptist State Convention under the leadership of Reverend Dr. Claybon Lea. Pastor Hodge is the President of the Congress of Christian Education for First Northern District Association. Pastor Hodge is an active member of the National Baptist Convention USA Inc. under the leadership Reverend Dr Julius R. Scruggs and attends the Congress of Christian Education under the leadership of Reverend Dr. George Waddles. He is also a travelling member of the National Evangelistic Training association under Reverend Dr. Lester Cannon. 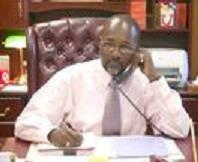 Pastor Hodge also has worked at Job Corps Centers in Cleveland, Ohio; Flint, Michigan; Morganfield, Kentucky; Tulsa, Oklahoma, Edison, New Jersey and Detroit, Michigan before arriving San Francisco, California where his last position was Deputy Center Director of Treasure Island Job Corps Center. Pastor Hodge’s leadership led to rebuilding the lives of many disadvantaged, disenchanted and distressed youth while promoting education and values clarification. He is presently a member of the San Francisco and Oakland Chamber of Commerce. Pastor Hodge is an active member of the Workforce Investment Boards in Contra Costa County and the Oakland Youth Council. He also serves as Executive Director for New Horizons Career Development Center in Rodeo, California. Pastor Hodge was installed as Pastor of Zion Hill Baptist Church of Rodeo, California in April of 2008. God delivered 146 sheep to His church of which 79 were baptized in our first year and we continue to grow as the Lord continues to add to His church. The church has undergone a major building restoration under the theme “Working to Rebuild God’s Temple”. Zion Hill has added a weekly radio broadcast (March to Zion), a website (www.march2zion.org) and a live webcast (www.zionhillbclive.com).